This easy to use Guide lists over 300 funding sources covering all the categories you need. The guide also serves as an additional resource for local authority education staff and managers within Multi Academy Trusts who may have responsibility for advising individual schools on raising funds from external sources. An Introduction to Crowdfunding that illustrates how this relatively new fundraising method can help your school to raise money. A Useful Links section that will help you to think more creatively about fundraising for your school. 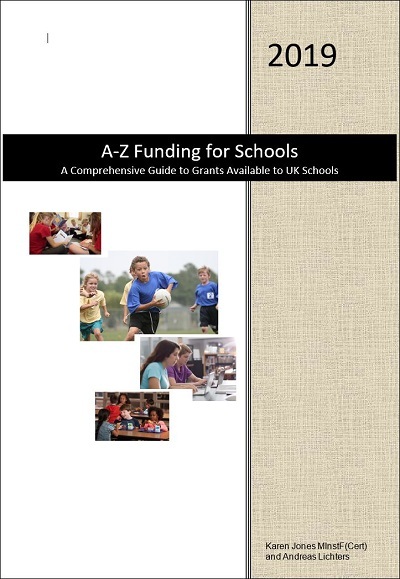 Download the A-Z Funding for Schools 2019: A Comprehensive Guide to Grants Available to UK Schools for only £54.60 (usual price £74.10) until the 30th November 2018.